We came… We saw… We siloed! Two weeks ago we checked off quite a few things on our bucket list, and even better it was all for the benefit of the business! We took a trip to Dallas, Texas to see what their Home + Gift Market had to offer and while we were down there we couldn’t resist taking a day trip to Waco! Now that we’ve settled back into our busy schedules we’ve had some time to reflect on our trip and hit the ground running with everything we learned. Our main priority for this trip was doing recon on home decor and furniture to elevate the business and provide the best of the best for our clients. While we were there, we noticed quite a few emerging and continued trends, gained more insight on materials and textiles used in the industry, and were able to see and test out furnishing lines we recommend to clients. The Dallas Market Center as a whole spans over four buildings and millions of square feet. Luckily, home decor and furniture are only really found in two of those buildings - but that is still a lot of square footage to cover in a few days! 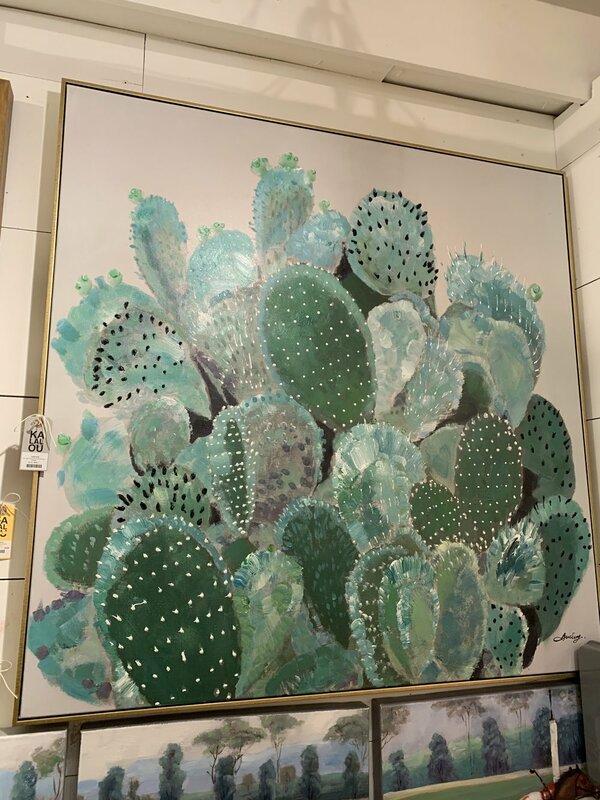 After walking through what felt like hundreds of showrooms we noticed we saw a recurring theme: cactuses, crystals, and lemons. Remember how pineapples were all the rage last year? You would see them everywhere - as jars, on dish towels, as bookends, candle votives, etc. Now this time around we were seeing cactuses and lemons used as the objects of inspiration. Pineapples were still scattered about in certain showrooms, but the most common decorations from kitchenware to home decor were cactuses and lemons. Crystals have also made their way into the home decor market and have become a popular decorative object to put in areas of your home such as your coffee table or shelves. We were definitely feeling the boho vibe going on! Moody velvets were making their way back into a lot of homes in early 2018 but have stuck around and seems like they are here to stay, at least for awhile. From mustard yellow side chairs to deep plum purple and navy pillows, there were so many vendors who incorporated velvets in jewel tones into their collections. In the last year we’ve definitely taken notice at the subtle use of acrylic/lucite in a lot of fellow designers work. It hasn’t seemed to catch on as much up here in the PNW (at least on our projects) but after visiting Dallas Market it was apparent that it’s being used more and more. Where we saw acrylic being used most was as lucite pulls on cased goods and cabinets, as bases/feet on furniture, and when mixed with gold, as mirror frames and bar carts. Layering a space with textures has long been the key to creating a cozy and inviting environment - no matter what kind of aesthetic style you’re aiming for. At this year’s market the textures we saw being used the most in home decor and furniture were faux fur, rattan, wicker, woven goods, and merino wool. Rattan, wicker, and other woven materials are all over the place! Used in light fixtures, furniture, case goods, and home decor - the natural/beachy/boho vibe is all the rage. The chunky merino wool blankets are still going strong as one of the coziest throws to use in any room. Faux fur is also a big contender as a material used in all sorts of places such as rugs, pillows, and furniture. Making our way down to Waco was a highlight of our trip for sure! As long Fixer Upper/Chip & Jo fans, we have always wanted to explore the sleepy little southern town that has quickly turned into a tourist hot spot. It was so fun to see the silos and grounds in person. There is a large open area where people can play yard games, lounge on bean bag chairs, and dine at one of the many local food trucks that are parked on the property year round. You can also shop until you drop at Joanna’s two story Magnolia Home or stand in line at the bakery for their famous cookies. Our favorite part was of course shopping at Magnolia Home and getting to see all her product lines in person. While they come at a cost, Joanna has created the MOST stunning faux florals and foliage. From tulips to eucalyptus to wreaths, the look and feel of the faux greenery was unmatched to anything we’ve ever seen before. Seriously, they felt and looked REAL! While they are on the pricier side of faux florals, they are most certainly worth it as you’ll be fooling anyone who walks through your home. You can shop everything at Magnolia Home. If you’re in Dallas and are looking to do some window shopping or just love browsing boutiques, you’ll have to check her out! There is also a clothing/home/gift boutique across the street called Favor the Kind that we fell in love with (and may have shopped a little too much, if that’s a thing?). And while you’re in the area, stop by Velvet Tacos for some of the BEST tacos we’ve ever had. And there you have it, our top takeaways from Texas! As always, let us know what you think in the comments below!